French playwright Yasmina Reza seems particularly interested in how small things become blown out of proportion. In her ubiquitous play Art, the close friendship between three men is threatened when one of them buys an expensive painting that another one thinks is crap. The Unexpected Man depicts two strangers on a train obsessing over the coincidence that one of them is reading a book that the other one wrote. And in God of Carnage, her 2006 comedy now making its Bay Area debut at San Jose Repertory Theatre, two couples meet to discuss an incident of playground violence between their sons, but their pleasant and civilized chitchat gradually gives way to chaos and savagery. Bob Sorenson, Amy Resnick, Joey Parsons and Benjamin Evett in God of Carnage. Photo by Tim Fuller. Translated by Christopher Hampton, God of Carnage won an Olivier Award for best new play after its 2008 West End debut, and its star-studded 2009 Broadway production won Marcia Gay Harden a best leading actress Tony Award. It was adapted into an unusually clumsy Roman Polanski film, 2011′s Carnage, with Kate Winslet, Jodie Foster, Christoph Waltz and John C. Reilly. (Amusingly, some reviews said it was a lousy movie of a great play, while others said it was a decent movie of a lousy play.) Now it makes its Bay Area debut at San Jose Repertory Theatre in a production helmed by artistic director Rick Lombardo that has already played Arizona Theatre Company. (Amy Resnick is the only local actor in the coproduction’s four-person cast.) Not long after the San Jose staging closes, Marin Theatre Company will do its own production in May. Lombardo’s staging effectively conjures the tension in the room, and the awkward pauses are terrific. Everyone’s very friendly and cautious with each other at first, but it doesn’t take long for the knives to come out in every conceivable direction. The play is 90 minutes with no intermission—and in fact it can’t have an intermission, because there are no scene breaks. Every time it seems like everyone’s ready to adjourn, someone says something that drags everyone back into the fray. Kent Dorsey’s impressive set depicts an elegant living room with rough stone walls that look like an ancient Mesopotamian ruin. This is the home of Veronica and Michael Novak—he’s a wholesaler of household goods, and she’s writing a book about Darfur. The Raleighs, Alan and Annette, are there because their son Benjamin hit the Novaks’ son Henry with a stick, knocking out two of his teeth. Alan is a lawyer, and their talk is constantly interrupted by cell phone calls in which he counsels a pharmaceutical company to cover up adverse effects of one of its drugs. This whole meeting is really Veronica’s idea, and Amy Resnick marvelously captures her judgmental anxiety, from the dirty look she shoots Michael when he sends her to bring everyone espresso to the way she keeps pressing the point of whether the Raleighs are really going to make it clear to Ben that what he did was wrong. Bob Sorenson’s Michael is an easygoing peacemaker, bordering on a parody of the open-minded liberal, just as Veronica exemplifies an uptight one. Benjamin Evett’s Alan is boorish and condescending, with little patience for this whole exercise. “Our son is a savage,” he says, and it’s useless to expect Ben to learn to error of his ways. Alan thinks that boys will be boys with the same cavalier attitude that lets him delegate all parenting responsibilities to his wife. The way he cavalierly drops crumbs from the clafoutis Veronica made all over the floor while pacing around yakking on his cell phone is priceless. Joey Parsons is especially funny as Annette, who’s chirpy and pleasant and eager to please at the outset but has a temper to be reckoned with. Lombardo keeps the energy high, sometimes to the point of being madcap. The extreme level of hysteria the play reaches (including a little gross-out humor) isn’t always credible, but the cast makes watching all the shifting rhetorical alliances so entertaining that it’s easy to suspend disbelief. The suggestion that we’re all howling apes under a thin veneer of civilization is ultimately a bit heavy-handed and unconvincing, but that doesn’t make all the tantrums and bad behavior any less fun to watch. 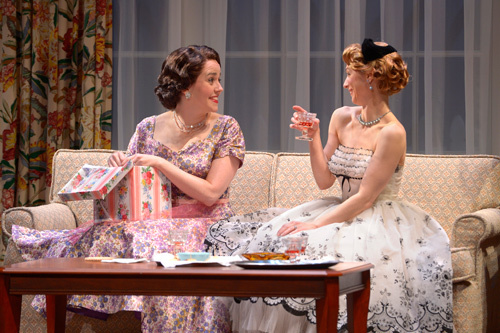 Emily Donahoe and Julia Coffey in Maple and Vine. Photo by Kevin Berne. The people depicted in Maple and Vine are also reverting, but much more intentionally than the ones in Carnage. Jordan Harrison’s play depicts a community of throwbacks who choose to leave the modern world behind and party like it’s 1955 and will remain 1955 forever. This sort of nostalgia is usually based on a sanitized Happy Days or Leave It to Beaver view of the ’50s that ignores the myriad ways in which that “simpler time” was much worse than today: segregation, the anti-Communist witch hunts, and repressive attitudes on gender roles, race, sexuality, religion, and almost anything you care to name. The people of the Society of Dynamic Obsolescence who’ve created their own hermetically sealed ’50s town are more than aware of these attitudes. They try to recreate them as best they can in the name of authenticity and talk a lot about trading one kind of freedom for another. In their minds women having to stay home and serve their men is a small price to pay for a society in which people actually talk to each other and make things instead of just ordering everything over the internet. No one’s been there long enough not to know what the world outside is like; they just choose to forget it. An Actors Theatre of Louisville and Berkeley Repertory Theatre commission that premiered at the Humana Festival of New American Plays last year, Maple and Vine now gets its West Coast premiere at American Conservatory Theater in an elegantly polished staging by Mark Rucker. The show starts in 21st-century New York city, in one of those ridiculously palatial Manhattan apartments that people always have in the movies but only a multi-millionaire could possibly afford in real life. Ralph Funicello’s set makes it sleek and ultra-modern, with a luscious view of downtown skyscrapers through the giant bay windows. Katha, a young editor of coffee table books, lives here with her husband Ryu, who works in a plastic surgery office—the implication is that it’s in some junior capacity, but that’s never entirely clear. The spaciousness of the apartment may be a bit of poetic license to fill ACT’s large stage, because the couple can clearly hear their neighbors yelling in another apartment. This isn’t the first we, the audience, have seen of Dean. The first few scenes cut back and forth between Katha and Ryu in Manhattan and Dean and his wife Ellen giving an orientation speech to new arrivals, contrasting the world they’ve chosen to the world outside. There’s some particularly funny stuff in these speeches, especially Ellen’s litany of all the foods you have now never heard of, from hummus to sushi to lattes. Katha’s enchanted with the idea of the retro settlement, albeit initially with a sense of amusement. Ryu thinks it’s crazy talk, and clearly a cult, but he’s reluctantly convinced to give it a try. Because Ryu is Japanese-American, the two of them have to be given a period back story that makes it plausible for them to be living in a mixed marriage. Emily Donahoe has an oddly childlike quality as Katha, like she’s lost and always in need to guidance, which makes her leading this expedition into the past particularly worrisome. Nelson Lee is bright and likeable as Ryu, with a constantly amused quality. Jamison Jones is a smooth man’s man as Dean, charismatic and ultra-confident, and you can see why he’s the one sent to draw new people into the fold. Julia Coffey, who displayed marvelous retro flair in ACT’s production of Once in a Lifetime earlier this season, is a revelation as Ellen, the very model of a perfect ’50s housewife. She’s the one who trains new arrivals and heads the authenticity committee that keeps watch on how well the community captures the feel of the period. There’s a lot of talk about how people kept secrets much better in days gone by, and Ellen gives a palpable sense of that. There’s a lot more going on with her than meets the eye. She’s also immaculately poised in Alex Jaeger’s stylish period costumes. As Roger, Ryu’s floor manager in a cardboard box factory, Danny Bernardy shows how frail that veneer can be. He’s very much a square, repressed ’50s guy, but he’s also obviously struggling with that role in a way that amply shows this chosen world’s unsustainability for people who, deep in their hearts, know better. For all the frustrations of alienation of modern life, society has progressed in the last 60 years, and it’s impossible to really unlearn the lessons of history once you know them. Bernardy and Coffey also play Katha’s catty, gossiping publishing-house coworkers who watch her like buzzards, waiting to swoop in when she leaves, and the contrast between their vapid modern selves and their severely repressed old-timey versions is striking. Maple and Vine is very much a concept play; you never believe in what’s going on so much as accept the premise for the purpose of exploring it, the way you might with science fiction. Most notably, and most problematically, it’s hard to understand why Katha buys into the place so readily, particularly seeing as how ’50s racial attitudes are going to make life tough for Ryu. Sure, she’s been depressed, but you get the sense that it could be anything that she latched onto. Her whole psychology as a character feels severely underdeveloped. For all its period theme, the play itself is very much of its time, that time being today. Most scenes are very short, intended for a 21st-century attention span. That’s appropriate enough, because the play isn’t really about the ’50s at all. Inside or outside the retro bubble, everyone is completely modern, and all the talk about their new 1955 life is always couched in comparisons with life outside. There’s nothing they do or say that isn’t a self-referential commentary on the good old days. It’s all postmodern play-acting of ’50s life, only it’s a serious game, with the intention of somehow actually living that way from now on. It’s no wonder that it proves so unsustainable for people in the play. It’s a lesson that the reactionary forces in today’s political life who talk about a return to those old-fashioned values would do well to learn. Haynes Thigpen and Peter O’Connor in The Aliens. Photo by Jessica Palopoli. The guys in Annie Baker’s 2010 play The Aliens have opted out of the social contract altogether. They’re also living in the past to a certain degree, reminiscing about the band they never quite had (the Aliens was one of many band names they never quite agreed on) and talking about stuff that happened in high school as if it still matters now that they’re 30. Now all Jasper and KJ do is sit around in the backyard of a coffee shop in Vermont, a yard they’re not even supposed to be in, staring into space. Jasper smokes a lot, and KJ steeps shrooms in his tea and sings amusingly inane little songs to himself (music and lyrics by Michael Chernus, Patch Darragh and Erin Gann). Evan, a teenage busboy at the cafe, tries nervously to get them to leave, but he soon falls under their influence instead. SF Playhouse artistic director Bill English’s set nicely captures the small, slightly run-down backyard for the company’s West Coast premiere, deftly directed by Lila Neugebauer. The pauses in particular are exquisite, as the dudes stare silently for an uncomfortably long time at Evan, or at nothing at all. In one scene KJ repeats the same word over and over for an unbelievably long time to truly striking effect. (It’s annoying, sure, but the annoyance soon fades into a kind of wonderment.) Baker, who also wrote Aurora Theatre’s recent Body Awareness, is suddenly all over the place, with another play coming up at Marin Theatre Company, and it’s easy to see why. Haynes Thigpen could not possibly be more laid back as KJ, a schlubby lump who’s lying on the ground if he’s not reclining against the fence on a picnic-table bench. KJ has an amusing habit of saying any random thought that comes to mind, made all the more so by Thigpen’s hilariously understated comic delivery. Peter O’Connor’s Jasper is more moody and agitated, fuming over what his ex-girlfriend’s up to. He seems just on the edge of hostility in the way he toys with Evan (whom he calls by his last name, Shelmerdine), but also clearly likes the kid. They always look as if they just rolled out of bed in Christine Crook’s appropriately grungy costumes. Brian Miskell is endearingly nervous and awkward as the clean-cut Evan, who’s helplessly weirded out by the layabouts’ constant presence where they’re not supposed to be. He doesn’t really have any friends, so on the one hand you’re happy with him that he makes a connection with these older guys, but on the other hand they couldn’t possibly be a worse influence, and he does indeed try to emulate these emotionally stunted losers as some kind of template for cool. As he clumsily tries to find his way in the world, your heart can’t help but go out to him, and Miskell ably embodies the teenage angst that eats at him. Initially an interloper, even if he’s clearly not interrupting anything, he becomes kind of the heart and soul of the play, if only because he’s the only one who really has a future. Ultimately the best thing his backyard pals can do is leave him to it. God of Carnage: Show #36 of 2012, attended March 31. Maple and Vine: Show #38 of 2012, attended April 4. The Aliens: Show #34 of 2012, attended March 24.